Making something sweet available to the public for the first time is risky, as Marie Antoinette found out when she tried to get them to eat cake, and found out they much preferred beef. Finally providing their own beef to cook up in your castle, 35 Degrees Premium Aged Steaks. 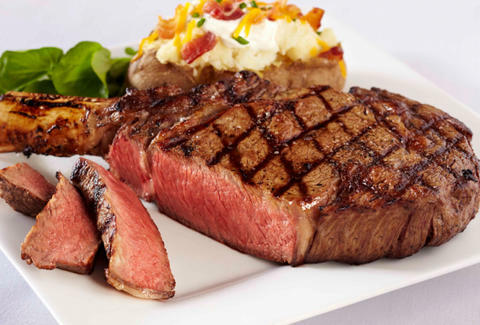 Available to the public after years spent exclusively working with top restos, 35D (named for the "optimum temperature for aging premium beef") is now overnight shipping their never-frozen, corn-fed, USDA Prime and Certified Angus to your pad in servings big enough for at least Foreman. All boxes are customizable to your carnivorous specifications, though pre-packaged options range from the aptly named "Manly Man" with three 28oz Porterhouses and four 24oz Cowboy Cut rib chops, to the eight 16oz NY Strip/ eight 8oz filets "King & Queen", to the massive four filet/ four NY Strips/ two veal Porterhouse chops/ two Kurobuta pork rib chops/ four 24oz Cowboy Cut rib chops "House Warming", which is best achieved by offering him some painkillers and a patient with a super-complicated disease. Further man-feeding packs include the "Game Day" with six 16oz NY strips and six 16oz "succulent (and) juicy" Rib Eyes as well as the 124oz NY Sirloin Roast/ monstrous 56oz Filet Mignon Tenderloin Roast pack called "The Grill is Gone", also one of Paul Wall's worst recurring nightmares. All packages can be gifted for any occasion (which they've conveniently listed on the site) including the stuffed-with-six-cuts "2-Week Protein Fix", enough to basically feed an army, or at least an angry revolutionary mob whose only beef is with you.